This April 2017 marks our 20th year anniversary as a Montessori preschool in the Bloomington-Normal area! We are so incredibly grateful to the families that made this possible and the wonderful children that blessed the rooms through these 20 years. We started small and have grown to three classrooms with 60 children total! 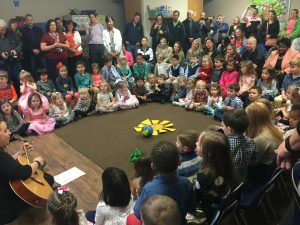 In celebration of our 20th year anniversary we invited families past and present of our preschool for a celebration ceremony. 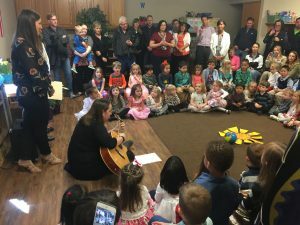 The children sang a very special song, written by one of our long-time teachers, Ms. Gettel, to commemorate this incredible milestone. The week leading up to the ceremony the children helped prepare by completing activities associated with “20,” including stringing (20) beads to make bracelets and scooping seeds into small take-home bags to be given to anyone who attended the celebration. 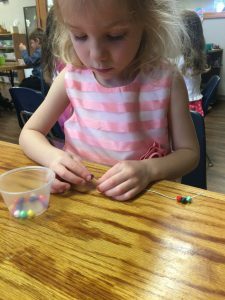 Stringing Beads is apart of the Practical Life area of a Montessori classroom. At our preschool each room has Practical Life areas in which the apparatus offered encourages care for the environment. In addition to Stringing Beads we offer Carpenter Work, Baby Care, Sewing, Water Transfer, Polishing, and more. 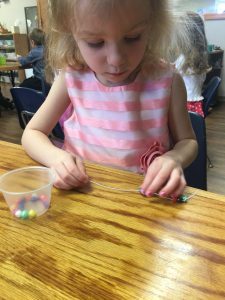 Stringing Beads teaches the children fine motor skills, concentration, patterning, and creativity. 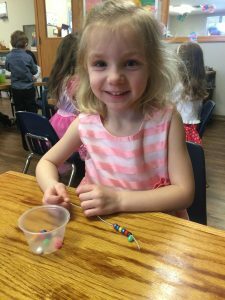 Specifically, this special stringing beads activity encourages counting to twenty! We are also grateful to The Pantagraph, who came to share in our celebration. 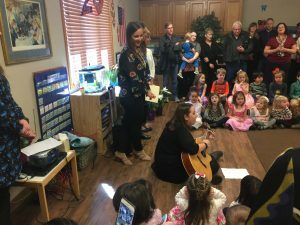 The feature article can be found here: Montessori school celebrates 20 years of growth.